The pontiff is greeted by traditional dancers at the airport. It is Pope Francis' first visit to Africa. 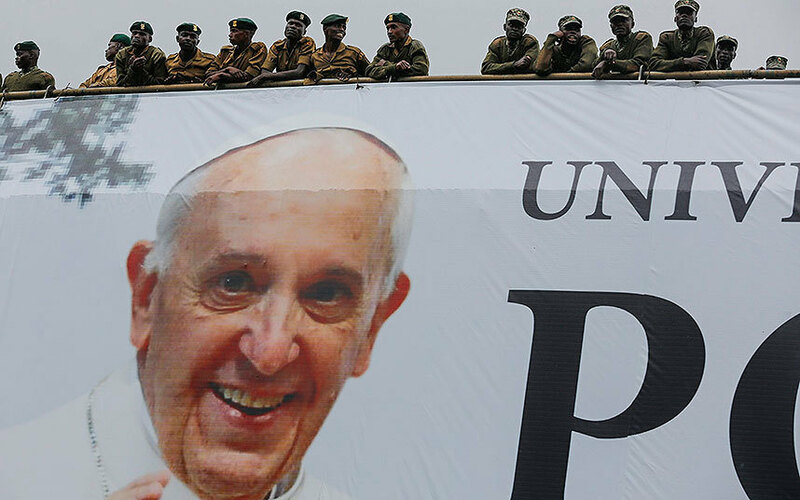 Security officers stand on a bridge as a giant banner of Pope Francis is hung at the University of Nairobi campus. 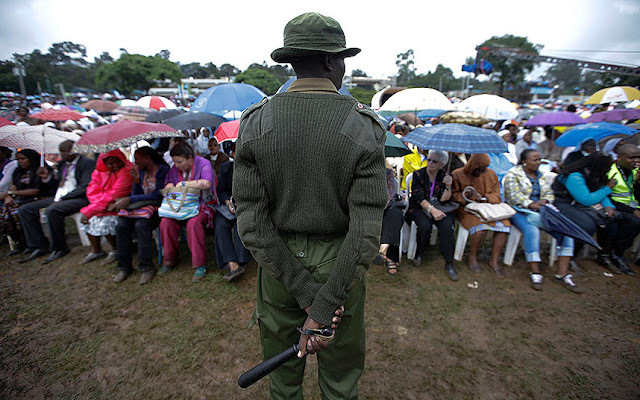 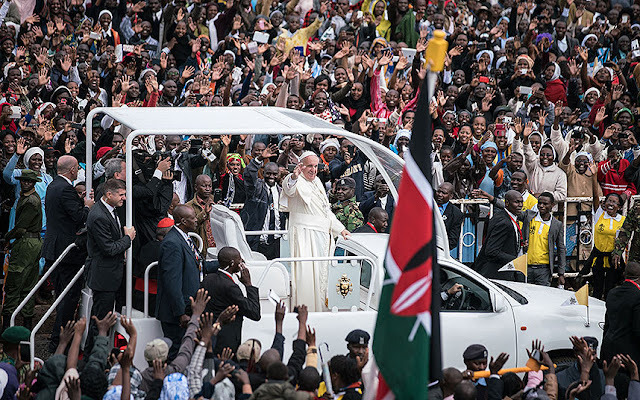 As with past apostolic journeys, the Pope has declined any special security measures. 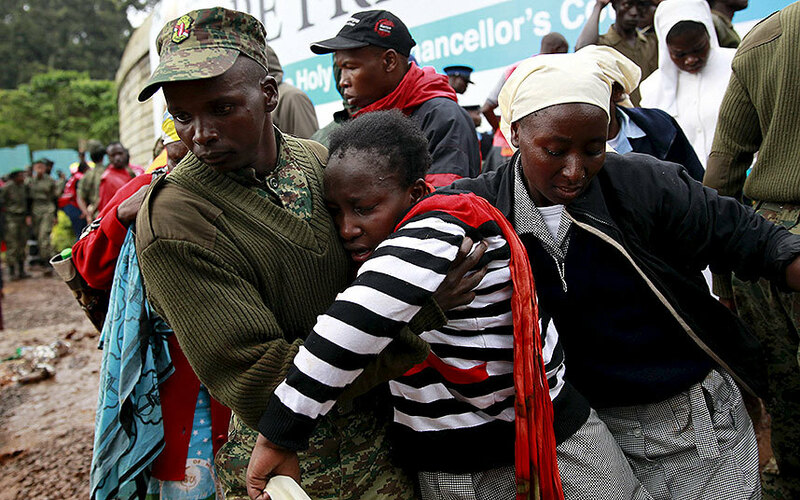 The authorities in Kenya have flooded the streets of the capital with up to 10,000 police along with other security personnel. 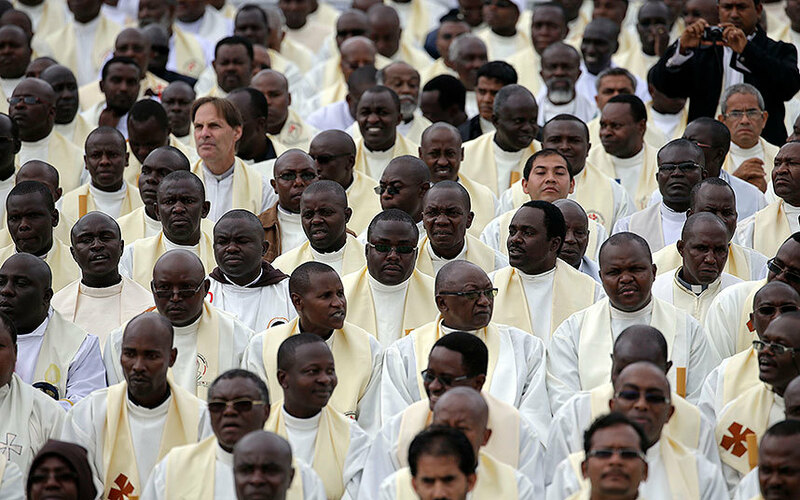 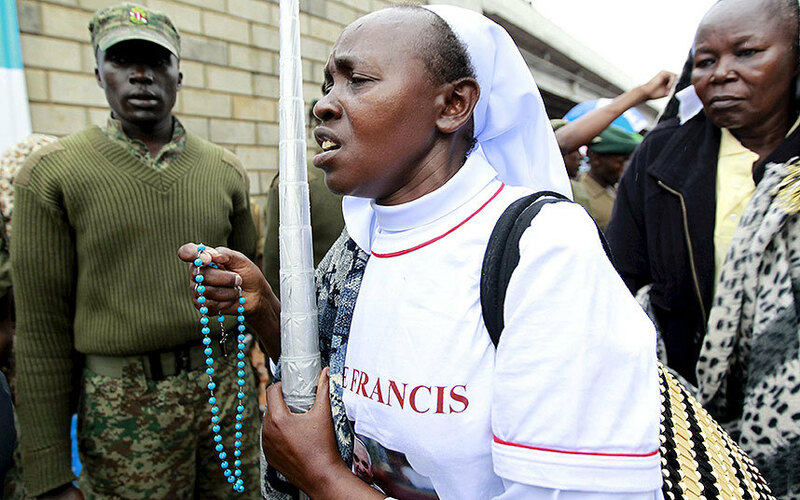 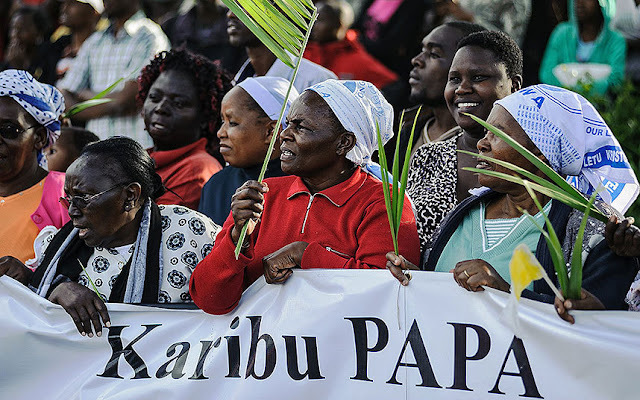 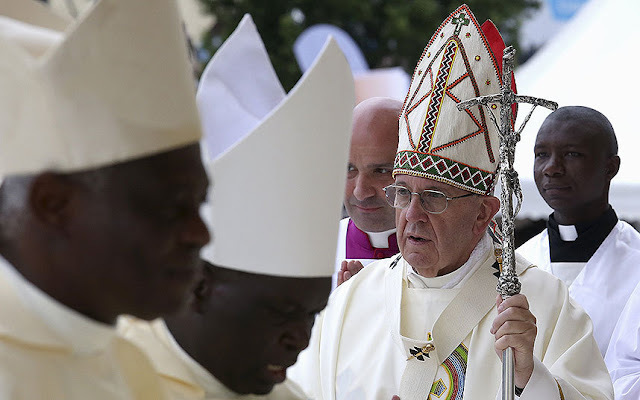 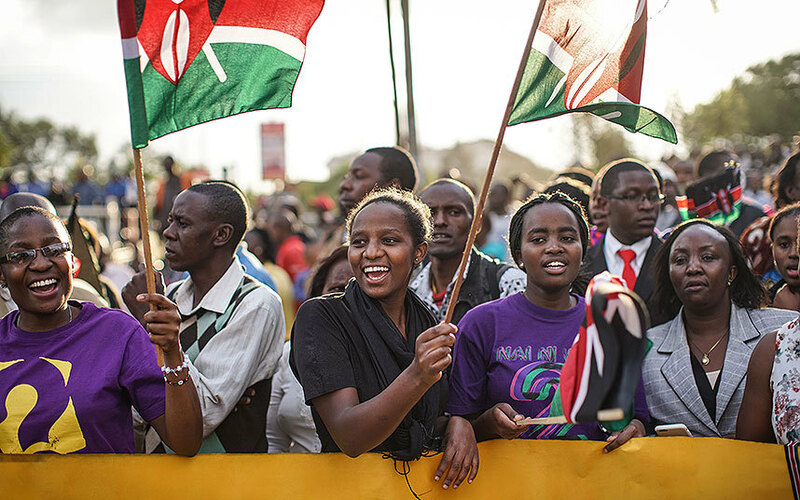 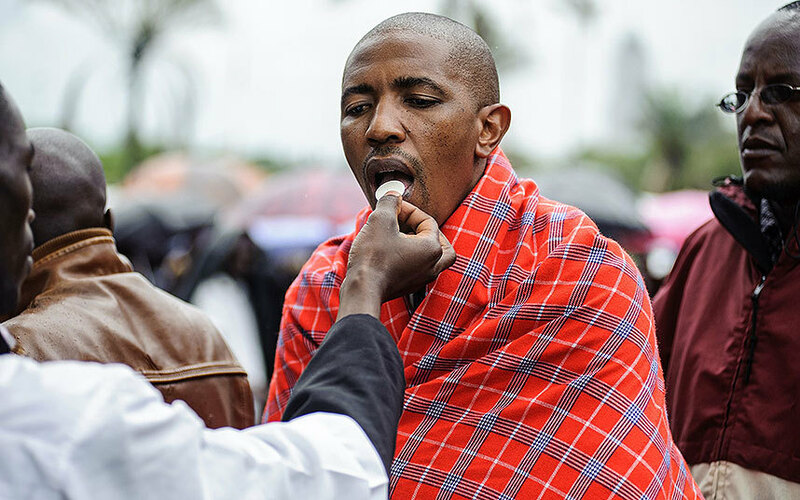 Millions of African Catholics, who represent what is expected to soon be the largest flock in the world, are expected to gather to see the Pope, presenting huge challenges for the security forces of the three countries. People walk by a billboard welcoming Pope Francis ahead of his visit to Bangui on Sunday. 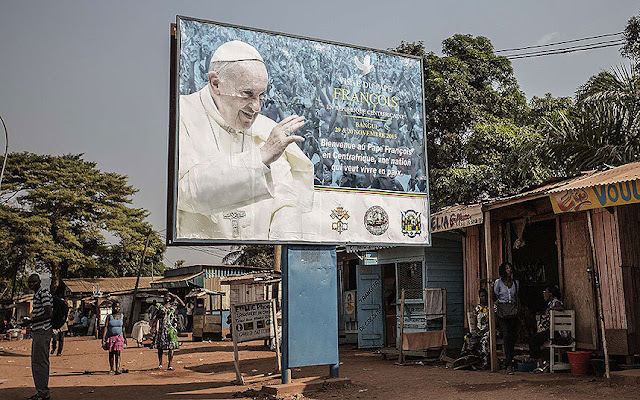 There is acute concern for the Pope’s safety in the Central African Republic capital, particularly in the light of recent terrorist attacks in Mali, Kenya, Tunisia, and other parts of the continent. A man walks past a mural depicting Pope Francis and the Archbishop of Bangui, Dieudonne Nzapalainga, with a Christian and Muslim embracing (bottom), in Bangui, Central African Republic. 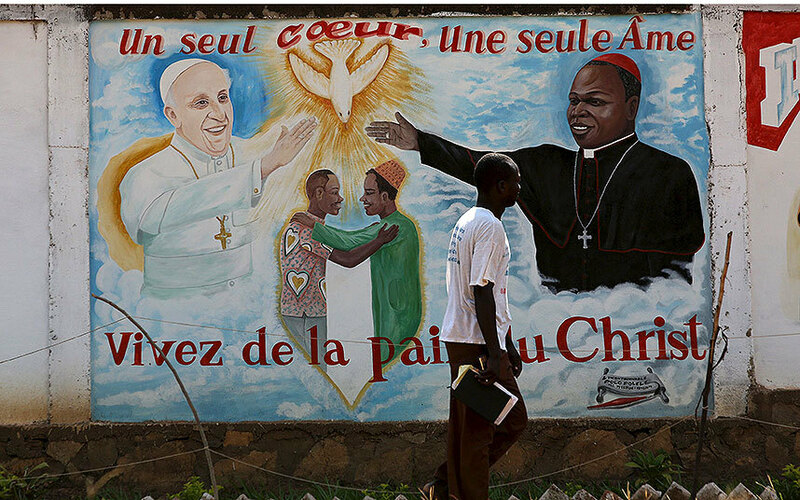 The text reads 'One single heart, one single soul' and 'Live with the peace of Christ'. 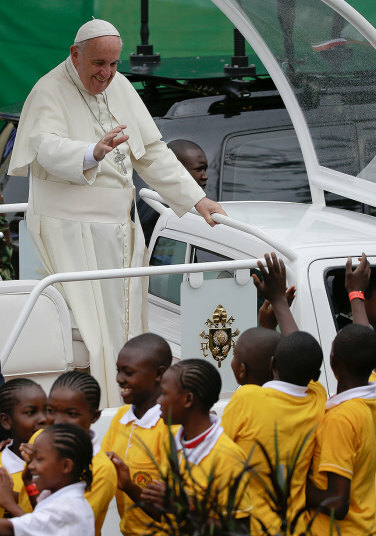 Pope Francis receives a raucous welcome from the crowd as he zooms around in his open-sided popemobile, some 10,000 police providing security. 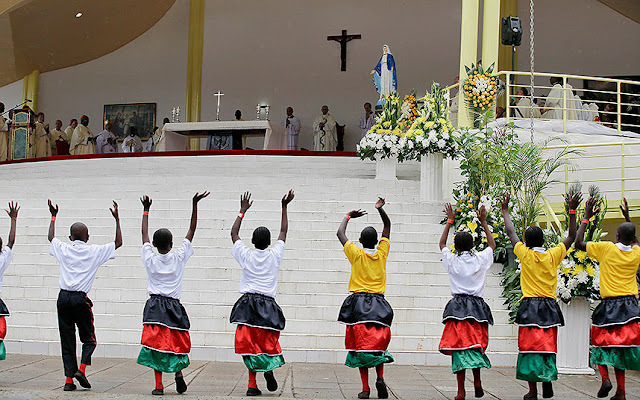 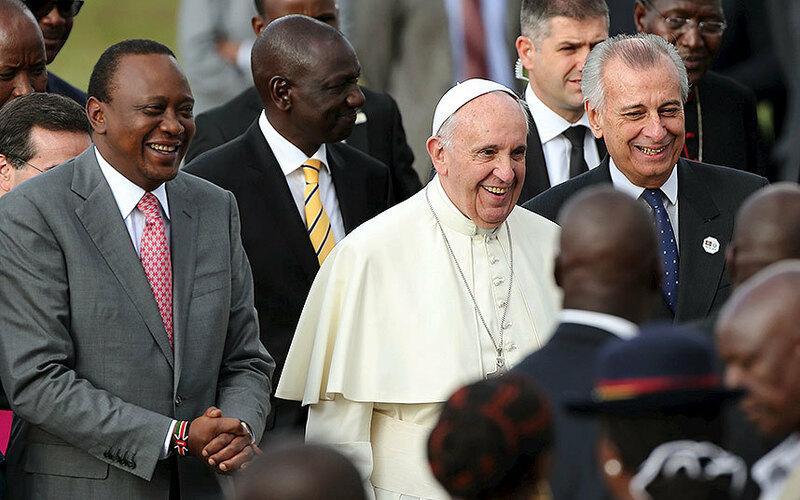 At State House, the pope called for responsible development in Africa and elsewhere. 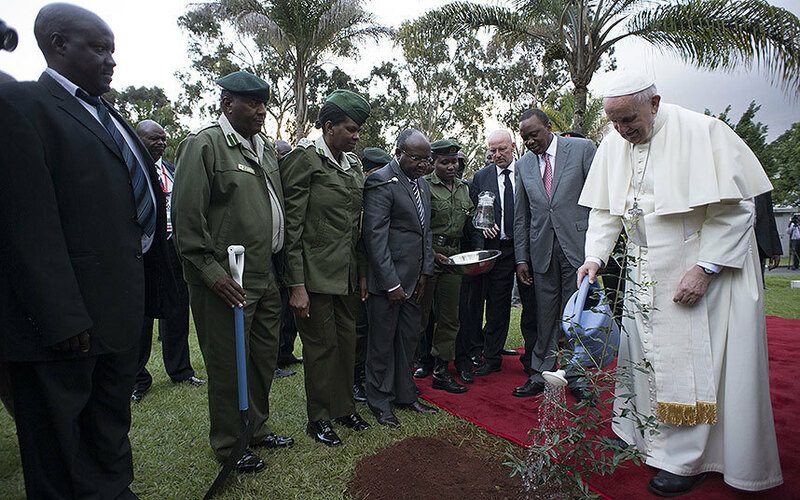 One of his first actions in Kenya was to plant a tree on the State House grounds. 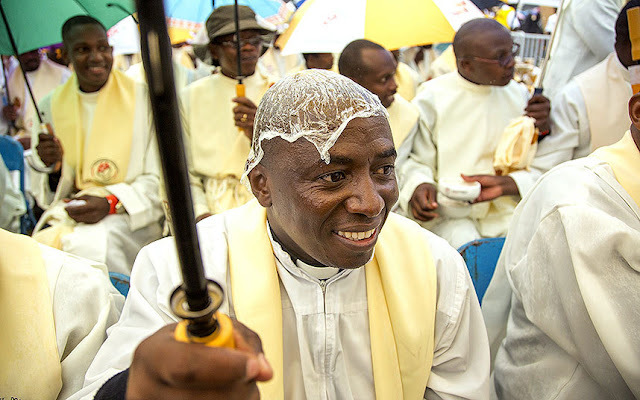 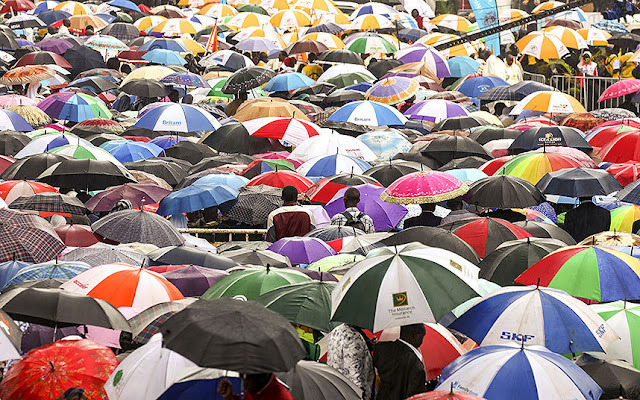 Some people had been at the University of Nairobi for the Pope's Mass since 3 a.m., braving heavy showers that turned the grounds into thick puddles of mud. 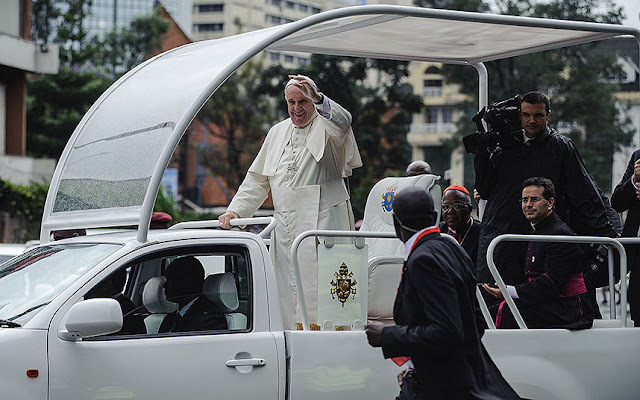 The Pope prefers not to use the highly fortified 'Popemobiles' used by his predecessors because he wants get closer to the people, security risks not withstanding. 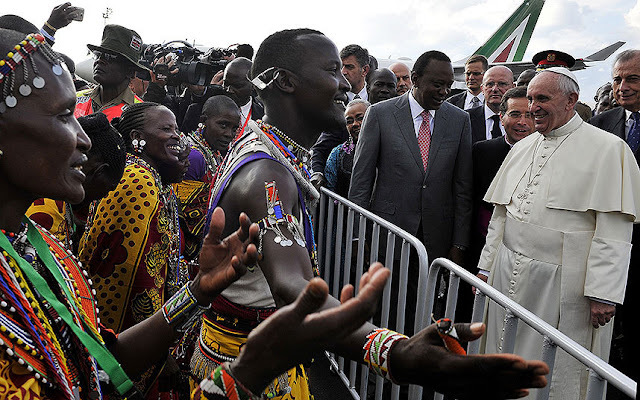 'I cannot greet the people and tell them I love them inside a sardine can, even if it is made of glass. For me it is a wall… It is true something could happen to me but let’s be realistic, at my age I do not have much to lose,' he told La Vanguardia, a Spanish newspaper, in 2014. 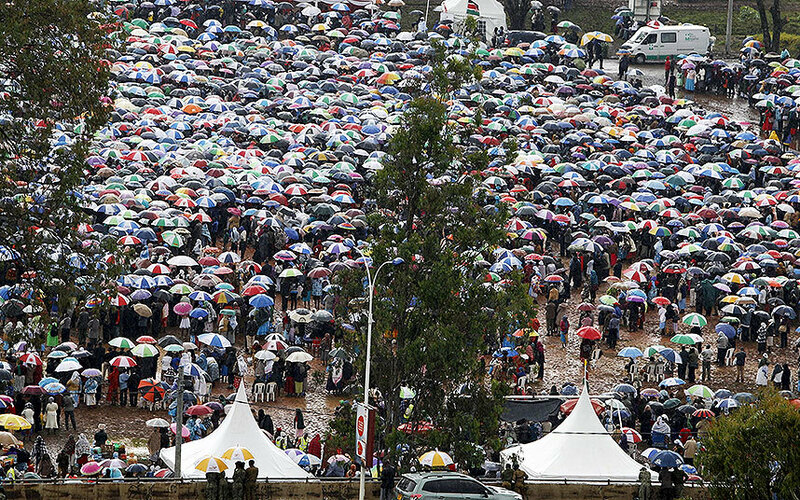 The size of the crowd at the University of Nairobi Mass - estimated by both police and the Vatican - was far smaller than the 1.4 million that Kenyan authorities had expected after declaring Thursday a national holiday. 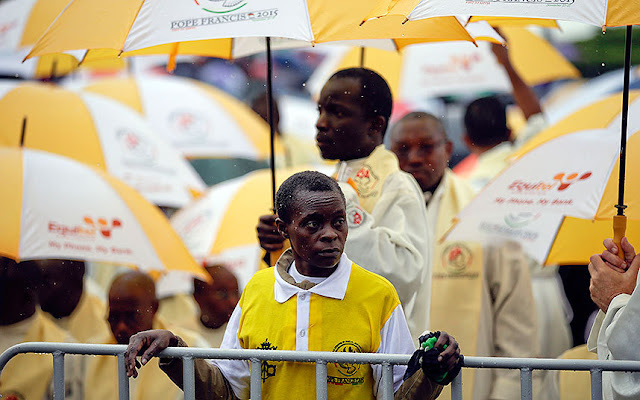 Vatican officials had predicted a maximum of a half-million people, and the lower number was likely due in large part to the weather. 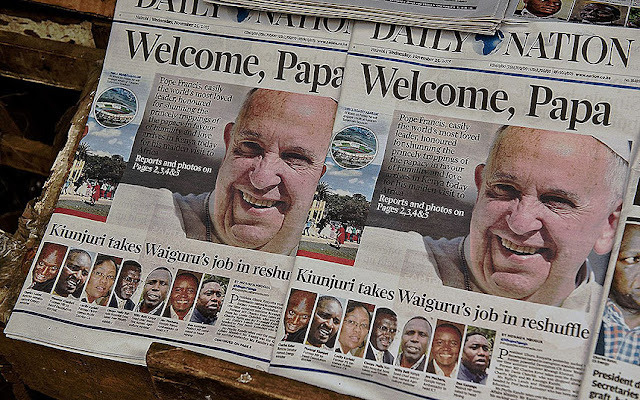 On Friday, the pontiff arrives in Uganda for the second leg of his trip.